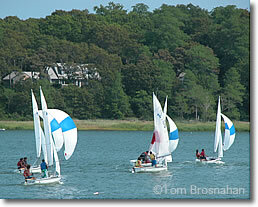 You will need several days to tour Cape Cod, a week to explore it thoroughly. The northern and western shores, facing Cape Cod Bay, are the more peaceful and bucolic ones (map). The southern shore has the more commercial towns. The eastern shore is mostly in the Cape Cod National Seashore. A leisurely drive along MA 6A through Sagamore, Sandwich, Barnstable, Yarmouth Port, Dennis, Brewster and Orleans, staying the night in one of these towns, or in Eastham. Wander along MA 28 west, enjoying Chatham and the towns on the way to Hyannis. Make your way to Mashpee, Falmouth and Woods Hole; or make a day-long excursion from Hyannis to Nantucket, or from Woods Hole to Martha's Vineyard. Sailboat race off Orleans, Cape Cod.